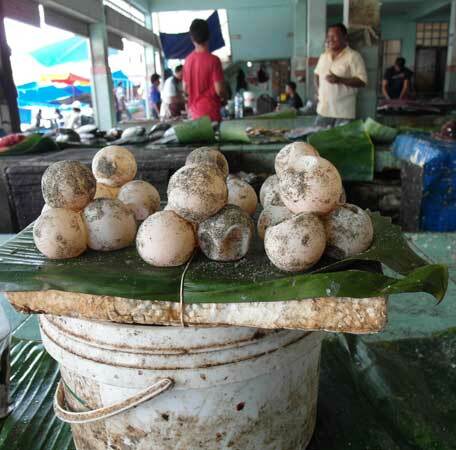 Turtle eggs for sale in Banda Aceh market. One pile sells for under two dollars. I don’t think giant clams are officially an endangered species, but I still wondered if I should feel guilty about eating one. Getting moral about what we eat presents us with so many dilemmas. I’ve always been surprised by moral vegetarians who happily eat fish. That’s the one thing that we still hunt in the wild, despite their getting harder and harder to find — surely that makes fish more morally problematic that meat which is bred for consumption? Giant clams are probably a no, though they are widely available here (and so very, very delicious). Turtle eggs are a definite no; there are even regulations against selling them, thanks in part to the work of conservation NGOs such as Yayasan Pulau Banyak. 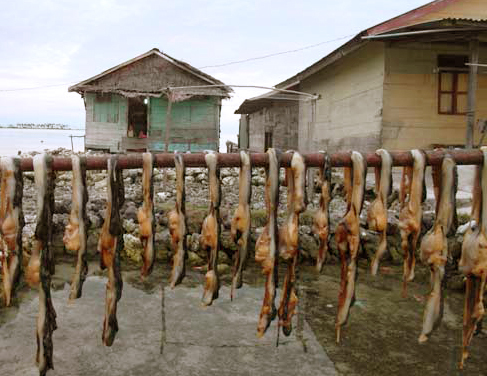 But that didn’t stop a young neighbour of the NGOs pleading with me to bring some back for her from the turtle breeding island of Bangkaru: “I’m pregnant. It’s my duty to eat things which are good for me”. And it doesn’t stop the traders in the main market in Banda Aceh, the provincial capital, selling them quite openly. A clutch of seven goes for just 20,000 rupiah, about US$ 1.80. I have no moral dilemma at all over turtle eggs; I don’t eat them. Though that may be because the only time I’ve ever tried them, in this very province some 20 years ago, I felt like I was eating slightly fishy snot bombs. If they were very, very delicious, I might be more conflicted. Be the first to comment on "Forbidden pleasures: What Elizabeth eats for tea"